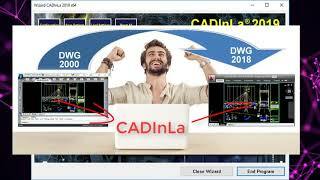 CADInLa 2019 is a modern stand-alone application that directly manipulates the DWG or DXF database structure. With CADInLa 2019, CAD users can analyze, manipulate, and fully automatically adapt any drawing to their own CAD convention, and erase any and all imperfections in the design. CADInLa 2019 offers a special programming language for advanced changing of the Layer structure. The abbreviation “CADInLa” comes from the full name CAD Interchange Language. Almost all complicated Layer structure changes are made possible using this program. CADInLa 2019 offers special methods for drawing translation between different languages. All used texts, layer names and attribute names from the drawing are listed and can be automatically translated into arbitrary languages. CADInLa 2019 supports all Unicode characters for Russian, Arabic, Chinese, Japanese and other similar texts, as well. The structure and components of any drawing can be analyzed using the Analysis Function in the CADInLa 2019 program. All used layers, Text Styles, special characters, symbols, blocks, Line Types, fonts, or used colors are listed in an analysis file and can be selected on the screen. All CADInLa 2019 settings can be saved and read in as required. All conversions defined in CADInLa 2019 can be executed at the push of a button on thousands of files at once. All CADInLa 2019 conversions are also performed in DWG blocks of arbitrary nesting depth.